Fortress Railing – Fortress Iron Railing & Accessories | International Wood Products, LLC. 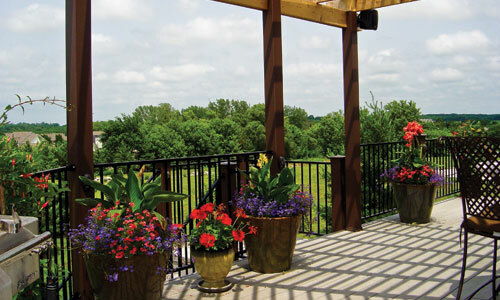 Fortress Fe26 Iron Railing is a pre-welded, easily customized and enhanced version of traditional wrought iron railing that brings unparalleled quality to any patio, deck or balcony. It provides a clean, classic appearance that is versatile for a variety of applications and surfaces. Fortress Iron features the FortressShield coating system – pre-galvanized steel, zinc phosphate, e-coat and premium powder coating. This makes Fortress Fe26 Iron Railing the most elegant and durable iron railing system on the market. Posts are available with pre-attached brackets for faster installation and lower labor costs. Why Fortress? Brackets – see the post section for PRE-ATTACHED BRACKETS!! !